Shrek will star in a new series on Netflix. 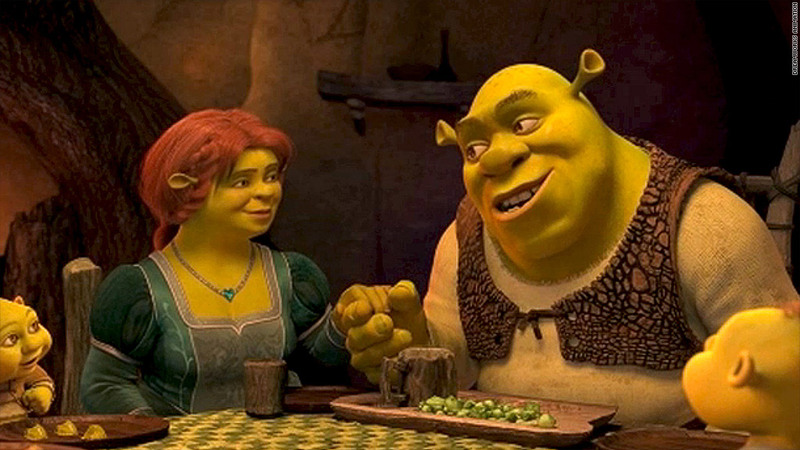 Shrek is coming to the small screen, as part of a deal Netflix struck with DreamWorks Animation on Monday. The multi-year deal to air 300 hours of original TV series on Netflix featuring DreamWorks' characters is Netflix's biggest deal to date for original first-run content. It's also part of a larger plan for DreamWorks to expand into TV production. As is typical for Netflix deals, financial terms weren't disclosed. Netflix shares jumped 7% on the news. The first series is expected to begin airing on Netflix (NFLX) in 2014. In addition to Shrek, the companies also said characters from DreamWorks franchises "Madagascar," "Kung Fu Panda" and "How to Train Your Dragon" are on tap to star in new TV series. Also next year, Netflix will exclusively air newer DreamWorks feature films including "The Croods" and "Turbo." As part of the deal, Netflix will also develop shows with some classic TV characters: Last year, DreamWorks (DWA) acquired the massive Classic Media library, which includes titles like "Rocky & Bullwinkle," "Lassie" and "Rudolph, the Red-Nosed Reindeer." Related story: Netflix bulls vs bears: Who has the upper hand? Netflix and DreamWorks had previously signed a small deal to air an original series based on "Turbo," which will premiere next month. Netflix is going all-in on its original content strategy. Last month's premiere of a new season of "Arrested Development" followed the splashy February debut of "House of Cards," for which Netflix paid a reported $50 million per season. The company has insisted it spends as much on original series as it would on exclusive deals for existing content, and it's letting many of those exclusive deals expire. Netflix allowed its Viacom (VIA) streaming deal to lapse in May, and in June Amazon (AMZN) snapped up the exclusive rights to air children's shows like "Dora the Explorer," plus adult fare from MTV and Comedy Central.